The constellation Aquarius. Roll mouse over to see labels. Aquarius is the tenth largest constellation, visible just south of the celestial equator in the months around August. 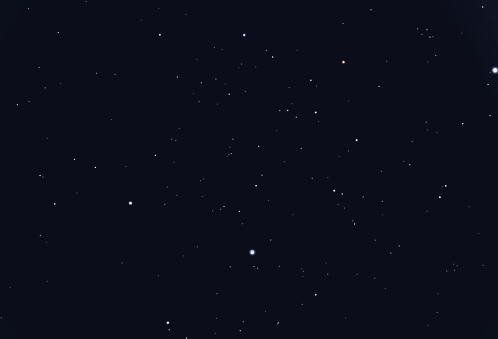 It is one of the fainter zodiacal constellations, lacking any stars brighter than third magnitude, but does have a dozen stars of fourth magnitude. It is also home to the bright globular cluster M2. Aquarius is usually depicted pouring water from a jar. The stream of water ends in the mouth of the southern fish, Piscis Austrinus, marked by the star Fomalhaut beneath Aquarius' feet. The meandering path of the stream itself is marked by a line of 20 faint stars. He is usually identified as Ganymede, in classical mythology the wine-waiter to the gods and one of Zeus' many lovers. Aquarius contains the following Messier objects: M2, M72, M73. Aquarius contains the following Caldwell objects: C55, C63. 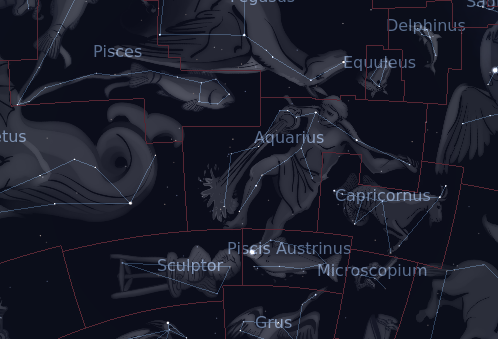 The following constellations neighbor Aquarius: Aquila, Capricornus, Cetus, Delphinus, Equuleus, Pegasus, Pisces, Piscis Austrinus, Sculptor.